Are you looking for a dog-friendly holiday? Have you seen our pet-friendly boats? Want to explore some pretty new dog-walking routes? If you’re wondering if you can even take your dog on a narrowboat then Fox Boats could be just what you’re looking for. Perhaps we’re biased but we think narrowboating is the ultimate in dog-friendly holidays and day trips. After all, what good is a day out if you can’t take your best friend? When you first arrive on board you might want to allow your faithful friend to fully explore the narrowboat, so that he can get used to his new home. Before you get going, prepare a bowl of clean drinking water, and then make sure there is also a bowl of water whenever you’re moored up, so that he doesn’t drink the river water. Dogs like to watch the fields and trees go by as the boat cruises along, and there are different smells and things to see with every passing moment. Smells of the countryside, such as sheep, rabbits, squirrels and ducks will delight your dog as you travel together. The waterways are busy with wildlife, so be aware that some dogs may be tempted to jump and chase when they’re on dry land! Every time you step ashore a whole new walk awaits your dog, with exciting smells and things to see. Towpaths are great for walking, just watch out for bikes (especially on the Cam to Cambridge). Games of fetch are out of the question though, unless you don’t mind losing your ball into the water. It’s best to keep your dog on the lead when mooring up, or when the boat approaches any locks, as it can be very dangerous if a dog falls in. (Do take a spare towel for the dog in case he does accidentally fall in.) 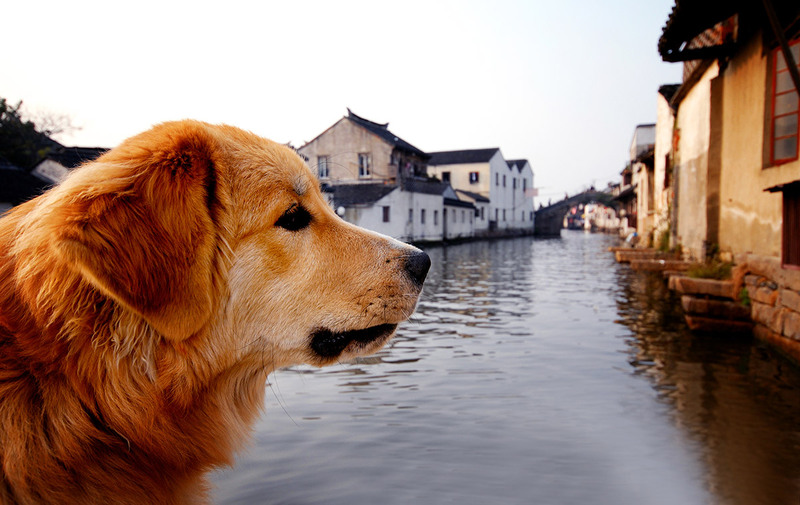 The banks of the waterways can be steep and difficult for dogs to climb out of, so consider bringing a dog life jacket. Jackets with handles on the top allow the owner to haul the dog safely back on board. Remember to also bring anything you else might need: the dog bed, lead and poop bags for example. You might also want to bring a spare lead in case you lose one overboard. Towpaths and footpaths are popular with nature lovers and dog walkers alike. Enjoy the unique Fenland countryside by walking alongside the boat as you approach a lock. Or take a longer stroll when your boat is moored up. It’s a great way to discover beautiful new places with your pet by your side. Taking a break from your usual dog walking routes at home means you can discover a variety of new scenery. If you and your dog want to walk alongside the boat as it travels, it’s easy to keep up as the maximum cruising speed is just 4mph. However, when you’re both tired of exercise and your pet is weary, but happy, you can relax on board the boat and watch the scenery go by. Passing pretty houses, bridges and villages will delight the humans among the crew. Waterside pubs are often dog-friendly, with beer gardens where you can sit outside. The humans can eat and the dog can meet other friendly dogs. If you’re struggling to find a dog-friendly pub there’s also the option of picking up a takeaway and heading back to the boat. Waterside pubs are marked on the maps and cruising guides provided with the boat. The Fox Narrowboat team have also shared their top three pubs for a Fenland narrowboat holiday here. If you want to bring your dog on a boat trip, just make sure you let us know at the time of booking. There is a charge of £30 per pet, per week. You can refer to the holiday narrowboat layouts to find our pet friendly holiday narrowboats. Dogs are always welcome on our day boats. Find out more about our dog-friendly accommodation. ‹ Au revoir Urban Fox and hello and welcome Rural Fox!